The Michigan departments of Health and Human Services (MDHHS) and Natural Resources (DNR) today issued a ‘Do Not Eat’ advisory for deer taken within approximately five miles of Clark’s Marsh in Oscoda Township. The advisory is due to high levels of PFOS (perfluorooctane sulfonic acid) found in a single deer taken about two miles from Clark’s Marsh, which borders the former Wurtsmith Air Force Base. PFOS is one type of PFAS (per- and polyfluoroalkyl substances) chemical. 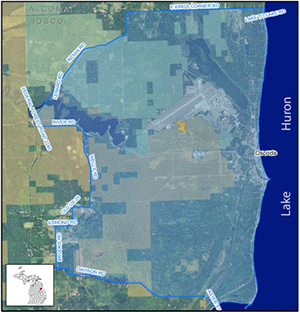 From Lake Huron west along Aster Street, west on Davison Road, north on Brooks Road, east on Esmond Road, north on Old US 23, north on Wells Road, west on River Road, north on Federal Forest Road 2240, north on Lenard Road, north on Indian Road, and East on E. Kings Corner Road (along the county line) toward Lake to Lake Road, to Lake Huron (see map). MDHHS and MDNR advise hunters to dispose of any deer in their freezer that may have come from this area and do not eat it. If you have health related questions please contact MDHHS at 1-800-648-6942. Hunters can contact the MDNR at 517-284-6057 or DNR-CustomerService@michigan.gov for information about deer tags that were used in this region.